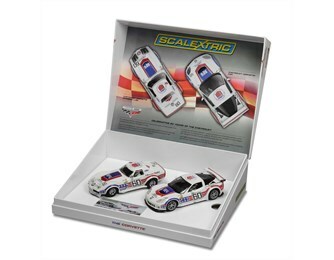 Thanks to our friends over at Scalextric anyone who signs up for a SLOT Magazine subscription or renews for a further 6 issues at the NSCC Swapmeet at Milton Keynes this weekend gets the chance to win a limited edition Scalextric Corvette Boxset worth £89.99! 2013 celebrates the 60th anniversary of a true American icon and one of the world’s most desirable sports cars; the Chevrolet Corvette. Now in its sixth generation, and an instantly recognisable symbol of American motoring history, the Corvette has grown from humble beginnings into a world class, high performance road car and an endurance racing legend. To commemorate such a milestone, Scalextric presents two of the finest examples of the Corvette from its illustrious back catalogue; the iconic 1969 Chevrolet Corvette Stingray L88, alongside the latest monster of the race circuit, the C6R. 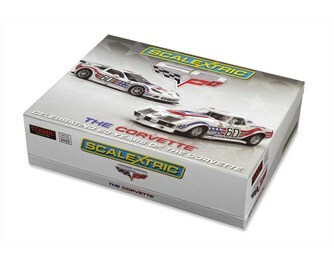 Each highly detailed Scalextric model boasts an honorary 60th anniversary livery; in keeping with the spirit and energy of the Corvette throughout its enigmatic years. As long as there is Chevrolet, there will always be the Corvette. The Chevrolet Corvette C6R is Digital Plug Ready (DPR) – convert for use with the Scalextric Digital range in under sixty seconds using the C8515 Digital Plug.